Easter Surprise Video Slot Machine - Casino Answers! Easter Surprise is a 5-reel, 20-line video slot developed by Playtech, featuring a wild symbol, scatter wins, multipliers, a free spins feature, a gamble feature and a bonus game. You can play the Easter Surprise video slot at Bovada. The Easter Surprise casino game is a penny slot. Coin values on the Easter Surprise slot machine are $0.01, $0.05, $0.10, $0.25, $0.50 and $1. You can select up to 20 paylines at up to 10 coins per line. This means that the maximum amount that you can bet per spin on the Easter Surprise online slot is $200 per spin. Players can manually skill stop the reels by pressing the “Stop” button in mid-spin. To play the Easter Surprise video slot, select your bet and press the “Spin” button. To spin the reels with all 20 lines at 10 coins per spin, you can use the “Bet Max” button. 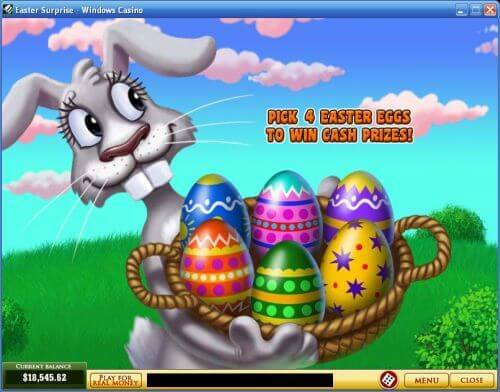 The top-paying symbol on the Easter Surprise online slot game is the Easter Bunny. 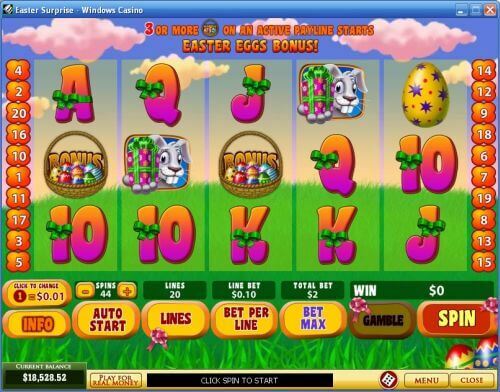 If 5 Easter Bunny symbols appear on an active payline, you will win the 10,000 coin top jackpot. The Easter Bunny is wild and will substitute for all symbols except for the scatter and bonus symbols. The next highest paying payline symbol is the Orange Egg symbol at 500 coins. The scatter symbol on the Easter Surprise slot machine is the Logo. Two or more Scattered Logo symbols anywhere on the reels can pay out up to 500X your total bet. Also, three or more of these Logo scatter symbols will win you 10 free spins at a 3X multiplier. All wins from the free spins feature will be tripled except for the Easter Eggs bonus game. You can re-trigger the free spins feature at any time. More free spins can be won infinitely. You can use this free spins feature to win lots of free cash when you play the Easter Surprise slot game at Bovada! If you are not satisfied with how much you have won on a spin in Easter Surprise, you can risk your winnings to potentially double your win with the gamble feature. Press the “Gamble” button after any win to activate the gamble feature on the Easter Surprise video slot. Your goal will be to correctly guess whether the next card will be Red or Black. You can keep risking your winnings until you lose, until you hit the “Collect” button or until you hit the Double Up Limit. In the case of Windows Casino, that limit is $5000. You can exit the gamble feature at any time. Payouts are made according to the Paytable. Only the highest win is paid per selected payline. Winning combinations pay from left to right only, except for scatter wins (which pay any). Payline wins are multiplied by the bet per line. Malfunctions void all plays and pays. Easter Surprise offers a basic autoplay mode to give players the ability to play multiple spins with minimal effort. You may use the “+” and “-” buttons under “Spins” to select from 1 to 99 autoplay spins. To begin the autoplay mode, press the “Auto Start” button. You can stop autoplay at any time by hitting the green “Stop” button that has replaced the “Auto Start” button. In the mood for Easter? Or maybe you just bought a bunch of Cadbury Creme Eggs on sale and want to celebrate with an Easter-themed slot machine. Whatever the case may be, the Easter Surprise slot brings all of the joy of Easter directly to you. See what the Easter Bunny has brought you (like some large cash prizes) when you play the Easter Surprise video slot at Bovada! Is there an Easter Surprise flash game that I can play? Yes, you can play a no-download flash version of Easter Surprise when you visit Bovada. You can play the flash game for free or real money. If you have any difficulties with the Easter Surprise no-download slot, download the latest version of Adobe Flash Player. Can American players play the Easter Surprise video slot for real money? No, American players cannot play Easter Surprise for real money at this time. Instead, we suggest you visit Bovada to play some USA-friendly online slots. Are there any other Easter-themed online slots? Yes, you can find read our Eggstravaganza Classic Slot Review or play it at Rival-powered casinos like Bovada.